Summary: One of the most simply designed resources on the web, Frantastique is more than meets the eye. It follows an ideology which believes in immersing the students in the language and culture while making use of AI. I would recommend it to people who know at least bits and pieces of the language and don’t care about spending the insane prices they’re asking for. The immersive lessons force you to sink or swim but the design is lackluster. The content that is presented to you is based on where you lack in the language and their revision system is very well done. With the high price and a limit on the number of lessons you can access per week, Frantastique is terrible value for the money. Price: Prices vary according to subscription length and plan. The one month and 3-years plans costs are as follows; $24 – $65 per month for the Basic plan, $36 – $98 per month for the Premium plan and $48 – $96 a month for the Pro plan. Progressing to higher plans gets you a few additional features but the number of lessons is limited to 5 a week in each case. There is also a standard 7 lesson free trial available. Francais Authentique would be the best alternative for immediate level learners looking for an immersive French experience. Rocket French is a well structured and comprehensive course for those interested in learning French. FrenchPod101 offers tons of podcast style lessons with additional materials at a very affordable price. 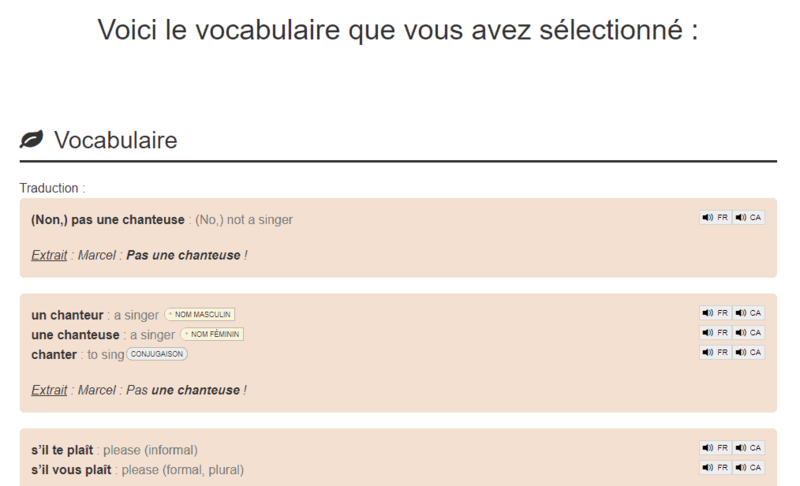 This is the first time I have used a language resource as unique as Fantastique. Even for someone like me who had some basic conversational skills in the language, the resource wasn’t a walk in the park to use. They boast about their impressive AI but with the high cost and absurd limit to the number of lessons you can study each week, I find it to be extremely disappointing. Instead of relying on AI, it would be cheaper to get tutoring from an actual person. I was also disappointed by the fact that it wasn’t all that much fun. Perhaps I had too high of expectations, but I didn’t feel any more engaged than I would have if I had used another tool. For now, let’s look a little closer at what exactly Frantastique does offer. Frantastique is probably the most free-form resource I have seen to date. This is partly because it employs artificial intelligence to cater the lessons to your needs. There is no definite endpoint. You can keep using the resource until you feel you have learnt enough to meet your needs. Frantastique can supposedly help you reach the C1 or C2 levels of fluency. There is also apparently a diploma waiting for you if you choose to go with the Pro plan. Technically, there are no separate divisions or sub-divisions. It is all divided into several lessons called chapters. These chapters test the general usage of the language rather than concentrating on specifics related to grammar or other specific topics like transportation, sports, and so on. These topics are introduced rather discreetly in the overall language usage that they are testing. In settings, you can select your interests. This includes what you would like to learn and what language skills you would like to improve. Based on your choice, the future lessons are then tweaked, and these topics are stressed. The first 7 lessons are more or less the same for everyone. The only thing that can change is what you must revise depending on the mistakes that you make. These lessons are a form of benchmark test that is performed. It lets you know your initial level so that you can track your progress throughout the course of using the application. They are usually a part of the free trial that everyone is entitled to. The only other distinction that can be made is the one between lessons, vocabulary, and grammar. While there are lessons that you have to complete daily, you also must view a list of words and grammar concept that their AI determines you are rather weak in. 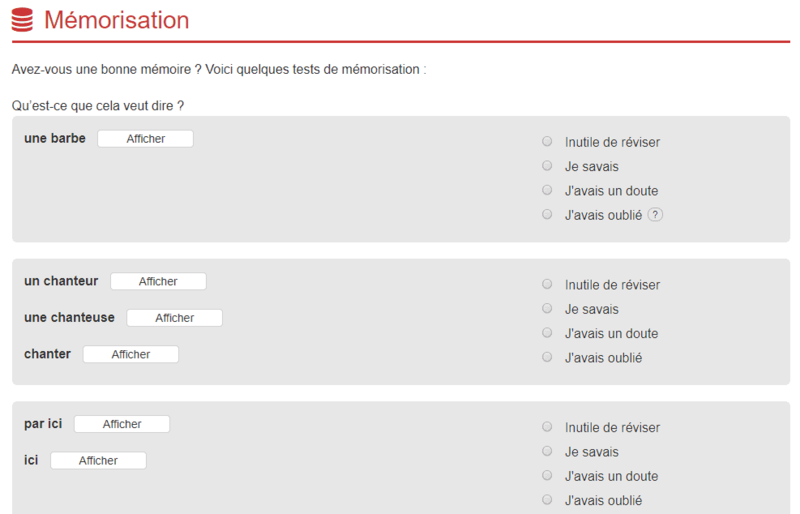 Other than this, all you need to do is answer more questions, revise religiously and improve your French. Getting started with Frantastique is extremely easy. All you need to do is sign up. You can do this either using your Google account, Facebook account or any other valid email address. Once you do this, you are sent a link to confirm your email address. After you get done with that, you will be asked a few trivial questions about your name and nationality. Finally, you will be sent a link to the first lesson via email. If you are using the application, you will get a notification about it. Usually, this is done every 24 hours. Unfortunately, you can only access one lesson a day or 5 in a week. However, if you are in the trial period, you can finish all the lessons in one sitting. Strangely, doing it this fast doesn’t give the computer enough time for customizing the lesson for you based on your profile. To access the lesson, you can either go to your email and check it, or you can try the application notification. The final way is to go to your profile on the website and go to the option of lessons. There you should be able to see the latest lesson being updated. Once you complete your first lesson, there is not much else to do to get yourself started. The only thing you can do is set your pedagogical interests. However, you will be asked to do so later anyway. This allows them to cater the lessons more to your needs, so you can get the most out of Frantastique. 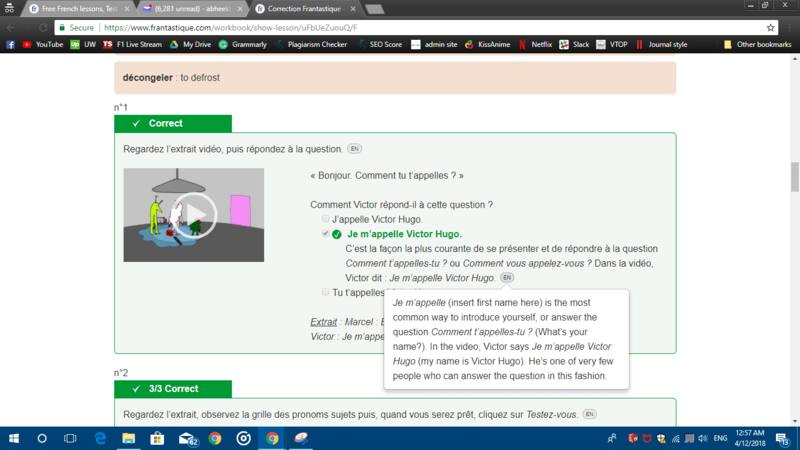 A unique feature of Frantastique is that all the lessons are in French. This relies heavily on the sink or swim principle. Remember how some coaches threw their students into the deep end of the pool hoping that student will learn to swim out of necessity? Frantastique works the same way. Everything from instructions, headings, buttons, questions, and answers, is entirely in French. The only thing that is in English is the help option. Every time you see instructions, you will also see an option to view the same thing in English. It will either be symbolized with a question mark (?) or the letters (EN). This gives you the instructions in English. However, the question and the answer aren’t translated. The lessons are structured according to what you need to learn. Thus, it depends from one individual to the other. However, few aspects of the lessons remain constant. The lesson starts with a video or an audio clip. All the videos are animated and follow a storyline. Unfortunately, the animation is quite bad – perhaps it was meant to be that way. The silver lining is that the content is mildly amusing. The videos generally come with subtitles for you to follow through if your listening skills aren’t up to the mark yet. After this, you will find a tab called Vocabulaire. This is essentially a transcript of the audio or the video that was just presented. You can go through the whole transcript and flag words that you don’t know which will later help you with your revision. Moreover, it is an excellent source to answer the questions that come after this. There is a part called the “petit indice” which gives you the meanings of the words that they think you should know. Once you are past the transcript, you will have to answer questions that are based on the lesson. But wait, there’s a catch. Most of the questions aren’t directly based on the video above. So, you can almost give up your hopes of finding the answers in the transcript. You will have to take hints from past lessons and the audio transcript that you just saw to try and answer the question. It’s okay if you get it wrong, don’t worry about it as the first 7 lessons are just to gauge your strengths. Even if you have crossed that landmark, you don’t need to worry about wrong questions as they will not impede your success. These exercises are mostly in the form of multiple choice questions with one of the options always being “I don’t know” or “Je ne sais pas”. There are few exercises where you must type, these are generally the conjugation exercises, where they first show you all the possible conjugations. Then you are supposed to go by memory and fill in the others. Other times, you might find a few listening exercises related to pronunciation. However, I have not yet come across a speaking exercise. This is a major downside as many people can’t pronounce the words unless they practice rigorously. You might face other questions with a new audio or animation or maybe even a comic strip. But the process is the same. You have a few follow up questions after that which may be related to something that has been spoken during the lessons already. The last part of any lesson is something called “Dessert of the day”. This is brief and gives you a bit of information about the French culture in the form of audio or video – something iconic. Once you are done, you can change the settings of your lessons. After this, you proceed to the corrections by clicking the huge green button. Just like your lesson, your corrections link is sent to you via email as well. The correction part is rather detailed. Here you will get to view the transcript of the lesson again and select words that you did not know previously. Be honest here and select the words that you have even a small doubt about. They will be added to your list for revision later. Then you have the detailed correction of all your answers. If you choose the correct answer, then you have the explanation as to why you are correct. On the other hand, if you choose the wrong one, there is an explanation about why you are wrong and an explanation about why the correct answer is so. After all the answers you have a part called the “Le cafe gourmand”. Again, this is a cultural part where they mention details about anything relevant to the French culture that has been mentioned in the lesson. You can go through it all to understand the culture better. As always, everything in the correction section will be in French. But you can use the help to translate to English and understand better. I recommend reading the French version first, then the English one and trying to correlate between the two. This will help you learn more words at a faster rate, what Frantastique probably intended to do in the first place. Here you will get to view all those words that you had originally not understood in the audio or video file. They give you the translations and use it in sentences to show how it is supposed to be used. Other forms of the word are given along with the pronunciations. Be sure to understand them as you might have questions from it in future lessons. You can also access this word list from your profile to practice whenever you want. Finally, you have the revision section. Typically, you get this at the start of every lesson.However, for the ease of understanding, we have put this part towards the end of the review. The revision starts with a part called “memorisation”. It shows you words or phrases that you had flagged earlier and then learnt later in the vocabulary section. Here they trust you tell them if you remember the meanings correctly or not. You have the option to select “I know”, “I had a doubt”, “I had forgotten”, and “No need to revise again”. There are other options available too. The cycle keeps repeating on and on. There is a mode called the easy mode which is comparatively easier as far as the questions are concerned. As in, they will be easier to answer. However, the methodology is the same. With over 400 chapters and new ones being released every month, you can keep learning till you’re satisfied. Plans and Prices – Ouch! The prices in this table may look reasonable, but they’re not! This is the cost if you purchase a 36-month subscription. I was honestly in shock when I saw how expensive Frantastique actually is. There are 3 plans available – Basic, Premium, and Pro. For each of these plans, there are monthly, half-yearly, yearly, bi-yearly, and tri-yearly subscriptions available. However, the pro plan does not offer subscriptions. The basic plan costs $65 a month if you pay one month at a time and you can get access to all the elementary features. This includes the nominal 5 lessons per week, personalized content, level assessment, and cultural lessons. The premium plan costs $98 a month in the monthly subscription and includes everything that the basic plan does. The extra features include premium support from the trainers at Frantastique and personalized lessons to improve your skills in every sector. Finally, the pro plan will make a deep hole in your pocket at $96 a month if you go for a half-yearly subscription with extra features like a diploma on completion (of your paid period) and support for your pedagogical interests. The part that stings more than the bank statement is the fact that they limit your learning speed. You aren’t allowed to learn more than one lesson a day or 5 in a week. For people who are driven to do more, this is a huge negative point. If there are any redeeming factors to Frantastique after reading the price tag, then it is the sheer intelligence of the system and level of personalization. When it comes to the lessons, it judges your performance on the previous chapters and accordingly sets the difficulty for the next ones. So, if you faced a problem with the earlier ones, then you will see it has become simpler and vice versa. Similarly, if it sees that you are making mistakes in a part of the language, maybe grammar or vocabulary, it will be sure to bring it up in future lessons for revision. Moreover, the list will always exist in your profile for you to look over and understand the problem. In this way, it is constantly improving your skills in the language by challenging you more teaching you stuff you don’t know. However, this is an iterative process and thus take a lot of time. When it comes to personalization, you get to select which days of the week you want to learn and accordingly ask it to remind you. You can also declare that you will be going on vacation which mutes the notifications for that period. Finally, you have the option of choosing what you want to learn the most. 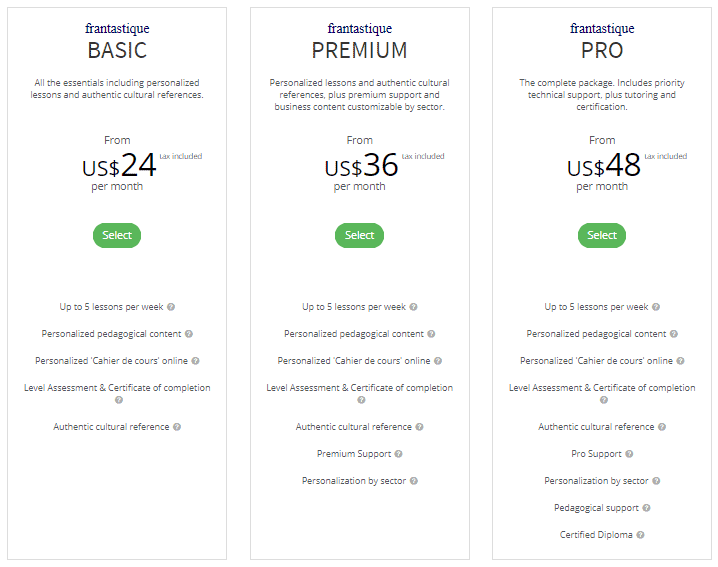 In the premium and pro plans, the number of choice increases in the pedagogical interests’ section. But the basic plan also provides reasonably important subjects to focus on. I found that the app worked well. Most of the content from the website is there and I just found it simpler to use – though the graphical interface is the same. The app notifications are also a good feature because let’s face it, people don’t really pay attention to email notifications. The only external motivation that I saw was the presence of something called badges. The badges are essentially accomplishments like completing a certain number of lessons. You could consider checking out your fluency level change and improve over the course of time as an appealing aspect. But other than that, there is absolutely nothing motivating you to come back the next day and complete the lesson. At the end of the trial period, you get to see your level (A1, A2, B1…) and break up of where your skills lack and where your strengths lie. At the end of the day, Frantastique brings a unique method of teaching to the table. However, it’s not something I would recommend. This resource is geared towards people with a basic understanding of the language who simply want to improve it. People with absolutely no French skills can try it too, but it will take them a significant amount of time to show any progress. Considering the price tag on the lessons for the limited amount of study time, it offers very little value. Sure it uses AI, but with how expensive the lessons are, you could just get lessons from a tutor. Overall, I found nothing exceptionally “fun” about Frantastique. But maybe the animations just weren’t for me. So, if you have a lot of money to waste, feel free to start using Frantastique to improve your French. But otherwise, I would honestly recommend any other resource like Francais Authentique, Rocket French, Frenchpod101 or even Duolingo. Sorry to disagree. Frantastique is fairly priced and the content is extremely well organized. I have reached a very high level of French through this platform. I praise Frantastique for their attention to detail. I have been with them for about 4 years and I still learn many nuances of the language with this subscription. Honestly said, Frantastique has taught me the richness of the language and additionally I study French Literature privately. I cannot wait until they come up with the German version. Frantastique Rocks!!! !